The other day at a certain Starbucks on the east coast of America. Name is? 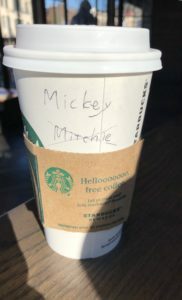 I was asked, so when I answered Mickey (my English name) I was firmly said to be Mitchie. Ms. Sekiya, who used to be an interpreter for Al Gore’s former vice president as a simultaneous interpreter, seems to have practiced the pronunciation of G considerably. 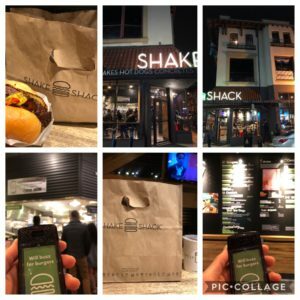 In my case, I was misunderstood as Mitchie at Starbucks in California, so I humblely practiced to pronounce K.
The next day when I ordered a burger at Shake Shack . I made K a plosive sound and said Mickey, I could not at least heard Mitchie. When I said that it was Mickey of Mickey mouse, the clerk understood with smile. After all English pronunciation is just good enough to be just right. By the way, starbucks coffee in the photo is white flat coffee. It seemed to be cafe au lait or cafe latte. I had not been to Starbucks for a long time, so I discovered that there is such a naming. Well, April will be a good month for you.